What is a Traditional Foods Diet? Wholesome recipes for healthy living on a budget. Welcome to Sweet Basil 'n Spice! Where delicious and nutritious are not mutually exclusive terms. Here you'll find practical shopping tips to eating healthy without breaking your bank. Click here to join me as I explore traditional foods around the world! Do You Have to Eat Meat on the Weston A. Price Traditional Foods Diet? Alternate title: The Right Way To Be a Vegetarian. One of the big things the Weston A. 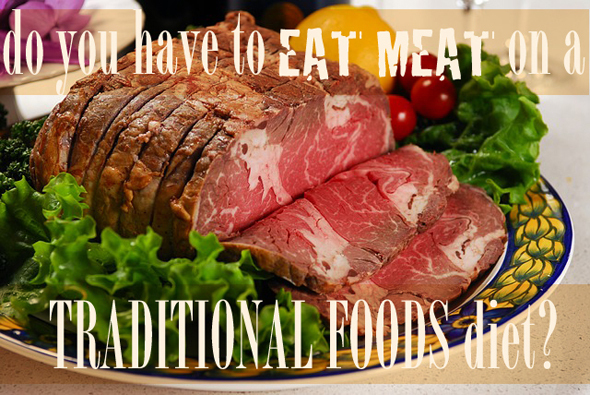 Price traditional foods diet celebrates is that animal foods like meat, eggs, and dairy are good for you. Animal foods from healthy, grass-fed animals are not only not bad for you, but the body needs certain nutrients found in these foods for optimum health. But does this mean we should eat gobs of meat every day? Does this mean we have to eat meat at all to be healthy? This is my first post on a three part series regarding vegetarianism and meat consumption, which is a hot topic in nutrition today. First I'll explain why we do need some animal products in our diets to be healthy. In my second post I'll go over ethical concerns regarding meat consumption and what the Bible has to say about this. My final post will be on the wise consumption of meat where I'll discuss which meats are better to choose over others, ways to digest meat more efficiently, and how a family who has a tight budget, or simply does not want to eat a lot of meat, can get the most benefit from small amounts. I'm excited to be putting this together as I've got a lot of thoughts and research I think you'll enjoy reading! Animal foods include beef, pork, poultry, other meats like rabbit and wild game, eggs, dairy, fish, fish eggs, shellfish and other seafood, and insects. As I explained earlier, a traditional foods diet is one that eats the foods our ancestors ate. 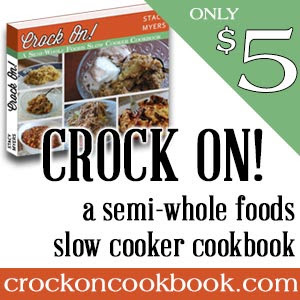 It avoids fads and even a lot of current methods of food manufacturing (like those to extract grain oils, for example). Sourdough bread, naturally fermented pickles, and naturally cured bacon are examples of traditional foods. There has never been researched a traditional diet that has been exclusively vegan (meaning that no animal products are eaten whatsoever, even dairy) and also produced children. Within some vegetarian societies are a few on the fringe who eat vegan (like the Jain scholars of India and very conservative Hindus) but these people are not expected to bear children. * Animal foods, whether from meat, eggs, dairy, fish, fish eggs, or insects have been diligently fed to women preparing to bear children, pregnant women, and nursing mothers. Though everyone needs them, it is in fertility and the growing of infants where the lack is most pronounced. *In my research I found there are some vegans in places like India that can bear children, but this is because their diet is not a true vegan diet. The foods they consume have not been treated with pesticides so there are tiny bugs and larvae present in sufficient quantity for good health. Also, this is not to say someone currently eating a vegan diet can't have children. The body has amazing ways of storing crucial nutrients to be used in times of pregnancy. However, it would be highly unlikely for a child who is raised vegan to be able to have children. Vitamins A, D, K2 and B12, are crucial for human development and optimum health. While some say you can obtain these nutrients through plant sources, there are two big reasons why this is not possible. The first is that plant sources of these nutrients are either not true forms, or are not easily assimilated. For example, carrots are said to contain a lot of vitamin A, or retinol. They actually contain a lot of beta-carotene, which the body can convert into some vitamin A, but a lot of fat must be present as vitamin A is a fat soluble vitamin. Additionally, the body is not always very effective at this process, especially an unhealthy body. According to my calculations it would take 18 cups of shredded carrot to get the same amount of vitamin A found in 1/3 cup of grass-fed beef liver. The good news for those who want to avoid eating meat, is there are indeed traditional societies that are lacto-vegetiaraim, meaning they consume dairy and usually eggs. Though probably the most common were societies that only eat fish, or fish and eggs. So the answer is YES, you can eat a nutrient dense, whole foods, traditional foods, even paleo/prima diet without consuming meat, as long as you are eating at least one of these other foods groups - eggs, diary, insects or fish. To me, an ideal meat-free diet would contain a lot of eggs and/or dairy from pastured animals, and wild-caught fish a couple times a week. Meat is very filling, so if you are not eating meat it is important to know what kinds of other foods you should be filling up on. Do NOT fill up on grains (even whole grains), with the exception of rice and suado grains like quinoa unless they are prepared properly. Grains need to be prepared in a special way or else they are digestive irritants. Do NOT fill up on raw vegetables alone. There is a certainly a place for raw foods in the diet, but the human stomach was not made to digest as much cellulose as is found in a raw foods, or predominately raw foods diet. We don't have four stomachs like a cow! Do NOT fill up on soy products. Soy contains phyto estrogents and can reak havoc on the endocreen system. For the lay person, this means they disrupt your hormones, which play an important roll in all the body's functions. Small amounts of traditionaly fermented soy like miso and tempe are okay, but they should be eaten in moderation. DO fill up on healthy fats such as coconut oil, butter (of consuming dairy), olive oil and palm oil. DO fill up on easy to digest starches like sweet potatoes, the tapioca and other traditional roots, squash, rice, and fruits. DO fill up on a variety of vegetables and vegetable prepartions including steamed, boiled, baked, broiled, even fried (in healthy oils, if course). DO fill up on nuts, though I encourage you to consider soaking them overnight in a salt brine and dehydrating them first if you plan on eating a lot. Nuts contain a lot of anti-nutrients which are nutralized during the soaking process. Raw nuts are better than roasted if you don't have time to soak. If preparing grain-free breads, choose almond flour that has been blanched. Many people who are vegetarian or vegan do not consume animal foods out of ethical concerns for animals, which are valid. Stay tuned as I'll be addressing that in my next post! Bright, crisp, and full of character, this creamy vinaigrette salad dressing is a refreshing addition to this summer’s fresh garden bounty! One of the first changes I made in my real-food journey was to start making my own salad dressings. Eating more leafy greens and fresh vegetables is an important step to a healthier diet, but unfortunately with this usually comes very unhealthy store-bought salad dressings. 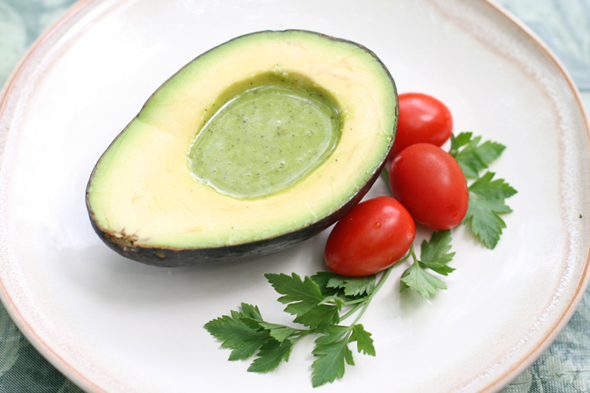 This parsley herb vinaigrette is easy to make and a simply delicious! Please head on over to Whole Lifestyle Nutrition for the complete post and recipe! This is primarily a recipe and health blog, but I wanted to share an easy project with you for helping those in need around you. "Giving a person a few toiletries and food items is something practical that anyone can use. You are making the choice for the person of how to use their money, instead of giving them the difficult task of deciding how to use the money themselves. It's not going to save the world, but the packages can be a blessing and encouragement to someone in need." I made four packages which I keep in ziploc bags and can pass out the window with a bottle of water when I see someone in need on the street corner. It only took one afternoon to put them together. Click below to view the rest of the post on my other blog. Hi! I'm Melodie and welcome to my recipe and nutrition blog! I follow a traditional foods diet and this blog is all about making this practical and affordable to the average person. In a society filled with conflicting diet information, I choose to eat the foods that nourished our ancestors. I am wading through a wealth of nutrition information, determining what the most important principles are, and implementing them on a limited budget. Join me! What I use to make fermented veggies. Inexpensive and easy to use lacto-frementation system. The best price I found anywhere. Where I get my coconut oil. 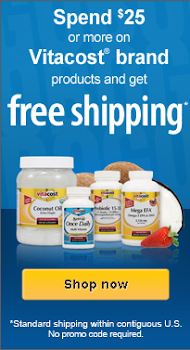 New to Vitacost? Order by clicking "shop now" to get $10 off! Copyright Sweet Basil 'n Spice 2013. Powered by Blogger.